For all those thriller fans out there, I’ll be at the Thrillerfest Conference in Manhattan again from July 8 – July 12. 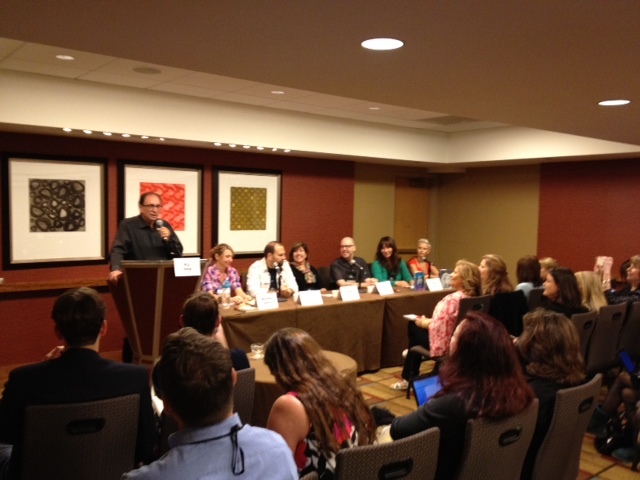 This photo above is from last year’s YA panel with the incredibly funny R.L. Stine as our panel master. This year they deemed me panel master (no small shoes to fill) and Bob will be on the panel: The Future of YA. In addition to R.L. Stine, my panel will have Allen Zadoff (who is nominated for Best YA Thriller of 2013! ), Meg Gardiner, Janice Gable Bashman, and Heather Graham. Last year, people told me our room-busting panel was the best one, so no pressure this year. I’ve been reading the panelists’ books in preparation and am planning a panel that will be lively and entertaining as well as educational. So no “go-down-the-line-and-everyone-answer-the-same-question” for us. Join us for the madness at 1:00pm on Saturday, July 12, with a signing at 5pm. You must be registered with the conference to see the panel but the signings are open to the public. CRAFTFEST & BOOK SIGNING Craftfest is the workshop part of Thrillerfest and requires a separate registration. It’s perfect for those who wish to work on the craft of writing. I used to attend before I was published, so it’s a special thrill for me to return as an instructor. I’ll be teaching a class on Wednesday, July 9th at 4pm called EIGHT FATAL MISTAKES BEGINNING WRITERS MAKE AND HOW TO AVOID THEM. If you are enrolled in Craftfest, you can’t afford to miss this. I’ve seen writers make these mistakes and get set back for years. Some still have not gotten published. Others were published and then forgotten. Don’t be one of those. A Q&A will follow the lecture so you can get your questions answered. A book signing immediately follows the class, from 5-5:30pm. The temporary bookstore that is set up by B&N for the Thrillerfest conference is upstairs in the Hyatt Grand Central. You can bring books from home or buy them there (bring your B&N card if you have one). I will have special swag and that’s another chance to ask me a question. Friday night I will be speaking to the new debut class, trying to help them in their crucial first year of publication. Ah, 2012 seems so long ago now.